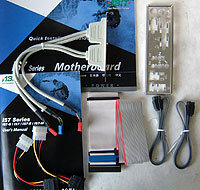 Abstract: Who could forget great motherboards like the BH6, BE6-II and BX-133? How about the more recent TH7II, BD7 or ABIT IT7 MAX2 Rev2 for the Pentium 4 processor? Whenever a new chipset is released overclockers and enthusiasts always seem to say "when's the Abit version coming out?" Is this a case of blind brand loyalty, or do these self described enthusiasts know something that mainstream computer aficionado's don't? As it stands, since the days of the BX chipset Abit have built themselves a reputation of openly embracing the overclocking community; mainly by producing some of the best overclocking motherboards ever. 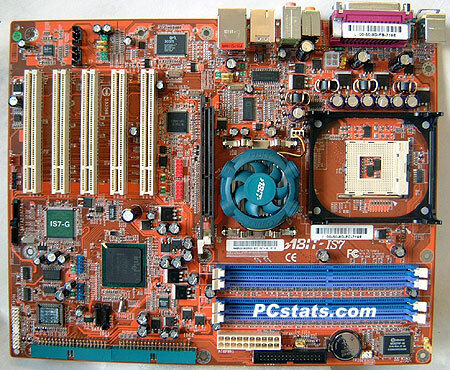 Who could forget great motherboards like the BH6, BE6-II and BX-133? How about the more recent TH7II, BD7 or ABIT IT7 MAX2 Rev2 for the Pentium 4 processor? When Intel recently announced their own dual DDR Pentium 4 solutions, the eyes of overclockers everywhere focused on the ABIT IC7 and IS7 motherboards.... ABIT's motto is "built for overclockers by overclockers" after all. Today we're testing out the Abit IS7-G mainboard. Based on the i865PE Springdale chipset we'll let you know if this board lives up to the lofty standards set by older Abit motherboards, or simply falls among the rank and file. Yes, I know there's more to a motherboard than just overclocking, but overclocking is just so much darn fun! The mainstream IS7-G supports 400/533/800 MHz FSB based Northwood Pentium 4 processors. The four DIMM slots can accommodate up to 4GB of PC1600/2100/2700/3200 non-ECC DDR SDRAM which should be juse plenty. In terms of onboard peripherals, the IS7-G has 5.1 audio, Serial ATA/Serial ATA RAID, IEEE 1394 and a 3Com Gigabit LAN. If you don't want the additional "goodies", there are other models which are a bit slimmer. Incidently, the "G" in IS7-G does not stand for graphics, but rather Gigabit LAN.